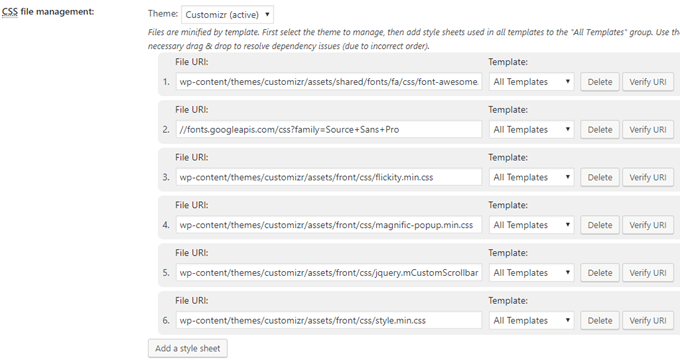 This documentation describes the process of speeding up your website designed with the Customizr WordPress theme, using the free W3 Total Cache plugin. The first reason is that it's free and very effective. 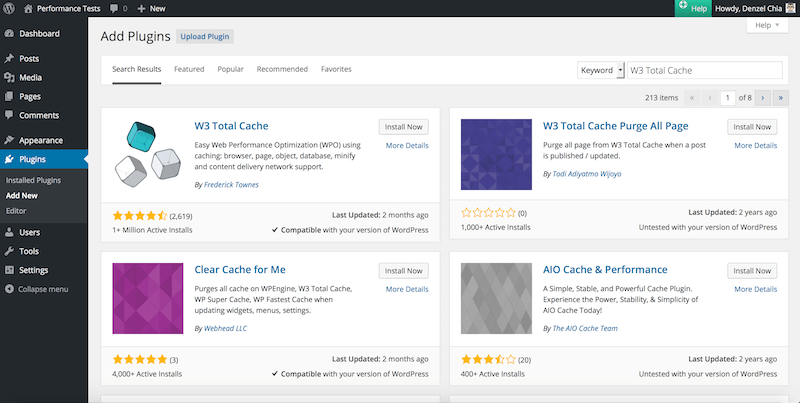 The W3 Total Cache plugin has been around for years and is successfuly used by millions of websites. However, it can be a little tricky to setup when you start using it, that's why we propose this simple guide for the Customizr theme. This results in faster page load times, and an improved user experience. In the following guide, you'll learn how to get excellent speed performance scores as measured by several online tools like, GT Metrix, PingDom, Google Speed Insight, and WebPageTest. 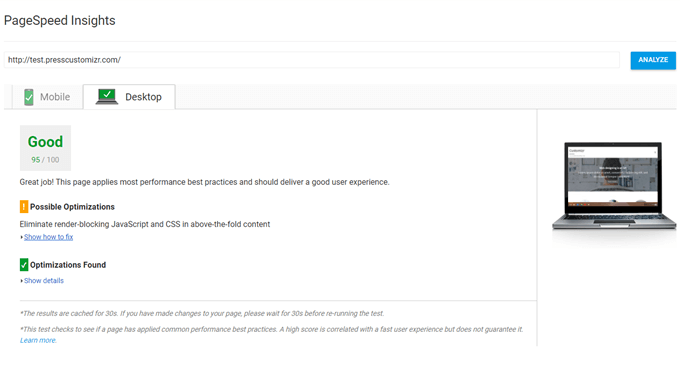 The PageSpeed Score is at 97%, the YSlow Score is at 86% and Total Page Size is 394KB, there are also 23 http we will attempt to further improve these results, after setting up and using W3 Total Cache Plugin. 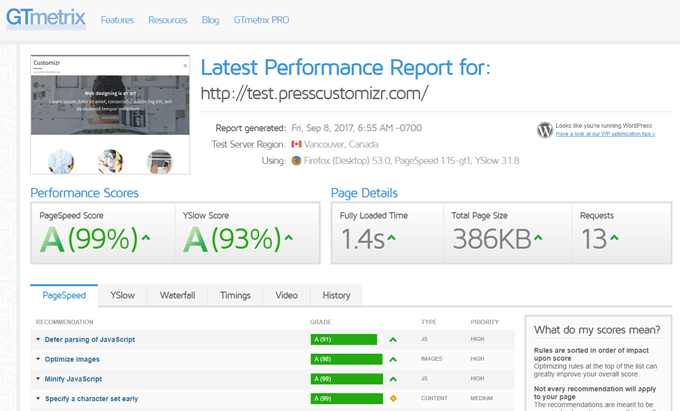 You should have already read the documentation on How to improve the page load performances with the Customizr Theme ? and carried out it's recommendations before proceeding with this advanced documentation. Looking at the latest PageSpeed recommendations, you may need to resize your image or compress them in order to increase page load speed. 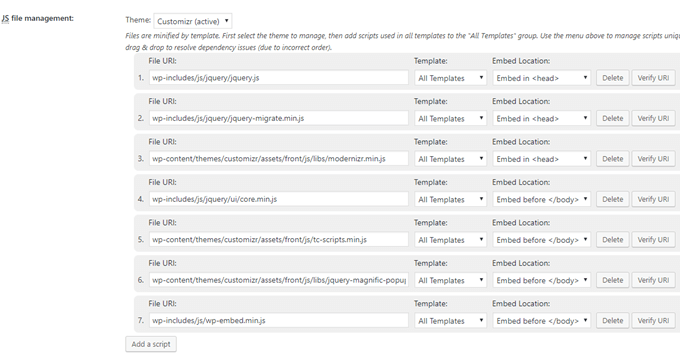 For more details, you can refer to the optimize your images section in the article How to improve the page load performances with the Customizr Theme. This option is for setting a Content Delivery Network (CDN). You will have to sign up for a CDN service, such as MaxCDN (recommended by W3 Total Cache plugin). That's all for the general settings, skip the remaining options and proceed to setup the remaining of the minify settings. Click on Add a script button, and you will see a set of inputs. Take note of the customizr folder name, if using Customizr Pro Theme, the folder name will be customizr-pro. Click on Add a style sheet button, and you will see a set of inputs. The following are an example of the font and color scheme that was set on our test site. You need to view your HTML source for your actual list of stylesheet URIs. You can see that there is a 2% increase in PageSpeed Score and 7% increase in YSlow Score! Furthermore the number of http Requests has been reduced nearly 60% of its initial value. That's a great improvement! 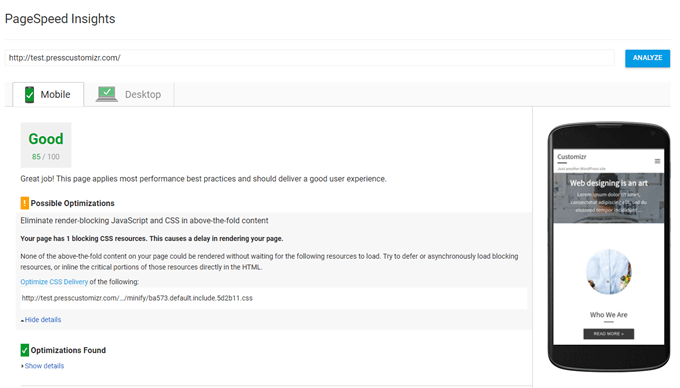 The Google PageSpeed Insight tool is the official Google tool to test both the speed and the user experience for mobile viewports. With the PingDom Speed Test tool, we see that the website loads faster than 88% of all tested websites. Pretty good !